Occasionally, those tales take a tragic turn. During a film shoot in 1923, an aspiring actress suffered a gruesome fate that cut short what may well have been a brilliant career. 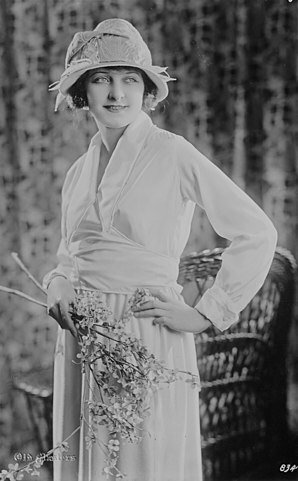 This actress not only shared her name with the city of Mansfield, but it was the city that was the source of her professional name – Martha Mansfield. Martha Erlich was born in New York City, the daughter of a Mansfielder, Harriet Gibson. During each year of her childhood and early adulthood, Martha spent the summer with her aunt here in Mansfield and always considered it her hometown. In 1923, Mansfield was given the lead in the Civil War era-set silent film, “The Warrens of Virgnia.” It was a big budget production, and the hope was there that this would provide a major set up for the actress. The movie was shot in San Antonio, Texas. Immediately after filming a scene where she was wearing a 1860s dress, Mansfield exited and went into a nearby automobile. Somehow, an errant match was ignited and caught her large hoop skirt on fire. It was never determined how the incident occurred, however the actress suffered horrific burns before her co-star managed to stop the flames. The chauffer burned his hands trying to remove her dress. Martha Mansfield died the next day in a San Antonio hospital, with the stated cause as “burns of all extremities, general toxemia and suppression of urine.” At her funeral, some 5,000 well wishers paid their respects. The Warrens of Virginia was released in 1924 with Mansfield’s scenes intact but with another actress billed as the film’s star. Mansfield was buried in Woodlawn Cemetery in the Bronx; she left an estate valued at $2,473. She bequeathed $22,000 in Liberty bonds to her mother. She also left her mother two life insurance policies worth $25,000 each. A number of film clips can be seen in a short tribute video at this location online.